Timothy Rees, the Anglican Bishop of Llandaf, composed a hymn in honour of St David. It included the words: “Glorious in the roll of heroes shines the name of Dewi Sant.” The icon on the front of your order of service also has that name inscribed, faintly, at the top. Dewi Sant! As we gather this evening to honour our patron saint, we must ask what lessons that glorious name holds for us. In fact, the name Dewi is a useful reminder for us of four values he would have us hold. “Do the little things.” Our Christian faith is a way of life, which brings love into the smallest actions. Many centuries later, St Thérèse of Lisieux would also show us the “little way” of simple kindness. We read that in David’s monasteries there was a life of hard labour – the monks did not use oxen to pull the ploughs, but did so themselves. They ate only vegetables. Nevertheless, there was something so attractive about David’s way of life that he shone out among his contemporaries and we are telling his story 1500 years later. What was that something? Surely the love with which every simple action was imbued. E is for the English Heresy. David famously found himself in dispute with the teachings attributed to the British monk Pelagius. Are we worthy of heaven because we “do the little things”? No! But it is all too easy to get drawn into the idea that God loves us because we do good, and this is sometimes called the “English heresy“. No! God loved us while we were still sinners, and sent Jesus to die for us. St Paul understood this clearly. He wrote to the Romans that this was the case, and in the letter to the Philippians we have just heard, Paul said: “I am no longer trying for perfection by my own efforts, the perfection that comes from the Law, but I want only the perfection that comes through faith in Christ.” Our Patron Saint, therefore, reminds us clearly of just how deeply God has loved us. W is for the Waterman. In an age before water treatment plants, when people regularly drank beer or wine because they were free of bateria, David insisted on drinking only water. He probably took part in the Celtic custom of praying while standing in an icy cold river, too. Was he doing that to earn God’s friendship? No! As an opponent of the teachings of Pelagius, he would have known full well that living an ascetic life would not endear him to God more than any other person. But he might have sensed that living this way would help him grow in self-discipline, and would show solidarity with the poorest people who would come to his monastery seeking help. In this way, David is a perfect patron of our Catholic aspiration, to live simply, sustainably, and in solidarity with the poor. I is for Inspiration. Today’s Gospel exhorts us to be salt for the earth and light for the world. Why did David ask us to be joyful and keep our faith? We are meant to inspire others. The world is a large place – we can’t be responsible for all of it. A patron saint reminds us that we are a particular people with a common heritage. (Even in the Bible, the Book of Revelation spoke of seven churches who each had their own angel.) We have a special responsibility to not only keep our faith, but to share it, in this place and nation which is our own. What will be the most powerful light to our nation? Joy! Pope Francis understands this very well: in one sermon last year, he said: “The identification card of a Christian is joy: the joy of the Gospel, the joy of having been elected by Jesus, saved by Jesus, regenerated by Jesus.” Our current Pope can’t seem to stop talking about joy; he even wrote an Apostolic Letter called The Joy of the Gospel! Dewi Sant confidently declared that he would “walk the path that our fathers have trod before us.” Do you share his confidence? When you die, are you sure of walking the same path as St David? You can pay attention to the details. You can love people by doing little things. Rejoice! Don’t fall into the English Heresy, but gaze deeply on the depths of God’s love. Even in your brokenness, Jesus loved you enough to die for you. Rejoice! You might not be called to be a waterman, but you can live simply and tread lightly in 21st century Wales. In this way, you can build a better Wales for everyone. Rejoice. You are called to be an inspiration to others. You can change other people’s lives for the better, by following the example of St David. Rejoice! The last words of today’s Mass will be: Awn ymaith mewn tangnefedd i ogoneddu Duw yn ein bywydau – “Go in peace, glorifying the Lord by your life” Our Mass does not end at the church door. Rather, you will be light to the world and salt for the earth when the name and the spirit of “Dewi Sant” shines forth in your words and actions. May the prayers of our patron saint go with you! Dewi Sant – gweddi dros Gymru! 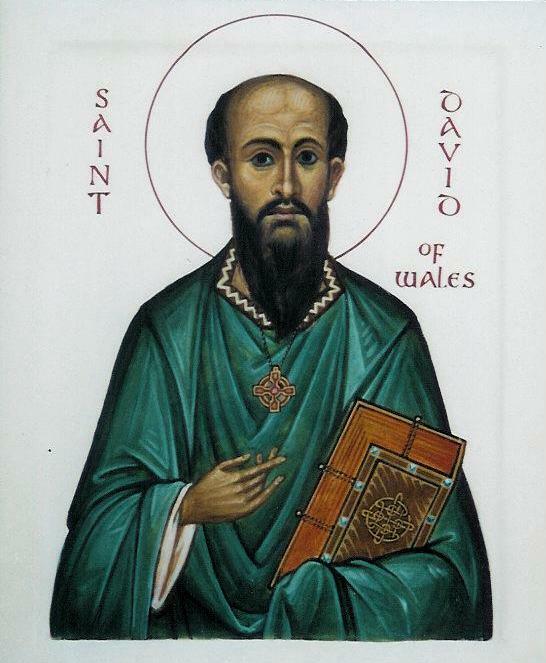 St David – pray for Wales! Homily at St Philip Evans, on the 1st Sunday of Lent, Year A. How can we know right from wrong? Our Lord was tempted by the Devil, who even tried to trick Him by quoting Bible verses. But Jesus knew what was truly right, and resisted. We’re unlikely to have a face-to-face encounter with Satan. “But the serpent was the most subtle of all the creatures God had made.” What the Devil began, the World continues. Just as the serpent questioned whether God had forbidden eating the fruit, so the world around us today questions whether our Catholic values are the right ones. Before Lent began, I preached about the challenge to tackle those temptations we know we have but don’t want to face up to. Today I want to talk about something different – about our hidden faults. There are things that we don’t recognise as sins because we don’t know the Church’s teaching well enough – or because we aren’t willing to recognise the Church’s teaching as correct. I went to see a film last week. Hidden Figures is set in the USA at the time when there was still segregation between black and white people. It tells the story of the African-American women mathematicians who helped NASA win the space race. There’s a memorable scene between Dorothy, the black woman who organises her team, and Vivian, the white manager who isn’t helping Dorothy secure a promotion to supervisor. “I have nothing against y’all,” says Vivian. “I know,” says Dorothy, “I know you probably believe that.” It’s a classic example of how a person can be blind to injustice because they have become so used to the culture around them. When the world around us agrees with our Catholic values, that’s a mixed blessing. If we agree that a particular action is sinful, society quickly declares it shameful. This deters people from committing the sin, but also tempts the rest of us not to show mercy and compassion to those who couldn’t resist. One sad example is in this week’s news reports from the time in Ireland’s history when it was so shameful to be an unmarried mother, that the mothers and their babies were hidden away in special homes. On the other hand, when society disagrees that something should be shameful, the church finds itself having to encourage us to swim the other way against the tide of people’s opinions. The thing is, it’s not up to us to make the rules – that’s the point of the story of the tree of the knowledge of good and evil. It doesn’t make a lot of sense if you say the Eden story is about knowledge. After all, if Adam and Eve didn’t know the difference between right and wrong, how could they avoid sinning? But St John Paul II gave us a deeper way of reading the story. He explained it’s not about knowing the difference, but about who gets to decide what’s right or wrong. We human beings sometimes want to say that something is OK when God’s already said that it’s not OK.
For those of us who have responsibility as employers or managers, this Lent might be an opportunity to look at how we treat our staff. Do we treat our employees in the way we would want to be treated in their place? Maybe you’ve never stopped to see it from that point of view before, but that’s what the gospel requires. This is the heart of what is known as Catholic Social Teaching – which brings the call to “love one another” into the workplace and to wider society. There’s a lot of talk about migrants at the moment. We might worry whether some immigrants might be terrorists, or be concerned whether there are enough jobs for British people. But it’s not OK for us, as followers of Jesus, to withhold good will from strangers, even when many politicians are voicing views about immigration. On sexual matters, too, public views have changed. That old serpent whispers into our society that marriage is really about saving up for the big party. That’s not what we believe, as Catholics. What’s really important in Christian marriage is that a man and a woman make a public promise to each other, to God and to us that they will stay together through thick and thin. If your values are truly Catholic, you will get married in church before you start a family, even if you can’t afford the wedding of your dreams. By doing that, you prove that God is more important than money, or what your friends think of you. If you think it’s OK to start a family before you’re married, you’ve fallen for the subtle voice of the serpent, which can take something beautiful – love! – and put it in the wrong place. He failed when he tried to tempt Jesus to jump off the Temple’s pinnacle. The time for Jesus to ascend from the Earth only came after he vowed himself to his bride, the Church, at the altar of the Cross. Sometimes society changes for the better. Hidden Figures showed a time when racial segregation was slowly being overcome, and we can celebrate that. But society often changes to say that things are OK when they go against God’s law. We can’t always change the world, but we can always encourage one another to resist the world’s temptations. While the world celebrates hidden figures, this Lent is a time for us to find our hidden faults. How can we know right from wrong? It’s time for us to go deeper, and ask how God’s Law asks us to behave, in areas we haven’t thought of before or where the world has made us blind. Let’s behave as the saints that God is calling us to be. Let’s change – and let’s BE the good news! Homily at St Philip Evans on the Seventh Sunday of Ordinary Time, Year A.
Today’s Gospel reminds us of something Jesus said, something which makes our Christian faith stand out from other religions. We’re asked – no, we are commanded – to be passionately committed to doing good for our opponents. I could probably end this sermon right now, because I’ve said all that needs to be said. Except… what happens when you are your own worst enemy? Usually when I preach, I try and say something for everyone. But there are times I share a message which won’t apply to everyone, but will be really important for those who need to hear it. Today is one of those times. Do you find yourself really difficult to live with? Do you find it hard to love yourself? Do you doubt that you are a fundamentally good person, even if you do things you regret sometimes? One in every ten people here today will suffer from clinical depression at some time of life. Maybe you’ve already experienced this, or are being afflicted by it right now. Loosely speaking, the sign of being clinically depressed is that you feel sad, hopeless and lose interest in things you used to enjoy – and these feelings continue for a period lasting more than a few days. If you find yourself in this situation, there’s no shame in getting help from your doctor. Often your doctor will recommend some kind of “talking therapy”, but sometimes the treatment will include antidepressant medicine. There’s no reason to feel ashamed of that, either. If you were an insulin-dependent diabetic, you wouldn’t hesitate to take that injection to restore the right chemical balance. If your doctor prescribes antidepressants, that’s doing just the same kind of job, restoring a temporary imbalance in those body chemicals which affect your mood. As I said at the start of this sermon, what I’ve just shared won’t apply to everyone. But if you find that these kind of prayers are useful to give yourself daily reassurance, then use them as often as you need to! Even if our own feelings don’t drag us down, sooner or later, our bad habits will. We’re less then two weeks from the start of Lent, and to begin Lent well, we need to spend a few days focussing on what we might “give up”. So it’s time to acknowledge that bad habit you’ve been trying so hard not to notice these last few months. Maybe it’s something your husband or wife has been gently nagging you about. Maybe it’s something that makes your children uncomfortable. Whatever it is, you know what it is, because you don’t want to tackle it. You’ve been pushing it to the back of your consciousness. It’s not a big thing – but it’s your thing, and you don’t want to let go. I’ve got good news for you. This Lent you can choose to tackle that little thing you’ve been trying to avoid. Be bold! Throw off your chains! Don’t give the Devil his satisfaction! The Bible today invites us to “correct our brother” when he sins against us. But Jesus also told us to take the log out of our own eye before taking the speck out of anyone else’s. Lent gives us permission to correct our own faults. So I’d like to invite you to spend the days between now and Ash Wednesday examining your own life, and deciding what your Lenten discipline will be. It might be giving up something – or returning to a diet you’ve let slip. It might be giving up smoking or drinking, whether just for Lent or for good. It might be taking on an extra daily round of prayer, or a weekly stint volunteering in a social project. But pay attention to that small thing you really don’t want to tackle. It’s probably the most important one of the lot. “Love your enemies. Do good to those who persecute you.” In that one part of your life where you know, deep down, you are your own worst enemy, show a little love. Even if you don’t feel lovable, be kind to yourself. After all, God loves you – loves you enough to die for you – and God doesn’t make mistakes. And keep on loving yourself, until “love your neighbour as yourself” starts looking like the challenge it’s meant to be! Help! I’m a Catholic who wants to evangelise! You are reading this page because you are a Catholic who wants to share the Good News of Jesus with other people, but you don’t know where to start. First, congratulations! Trust your instincts. Don’t listen to the people who say “that’s a Protestant thing” or “Catholics don’t do that”. On the contrary, heed Pope Francis who reminds us that all Catholics are called to be Missionary Disciples. There’s a broad sense in which all the good works done by the Church are ‘evangelistic’. But not all of the Church’s good works explicitly speak about Jesus. There’s a blurred line where evangelisation stops and catechesis begins, at the point where a listener knows Jesus is real and wants to learn more about him. Nevertheless, you know you aren’t called to join the SVP or be a leader in your local RCIA group. You want to evangelise – you want to introduce people to Jesus. But, how do we evangelise as Catholics? The best place to start depends on your context. Who are you working with and for? There are a few of us in the parish, but the priest’s not supportive. We’re in a group set up by the parish priest. I am the Parish Priest. I’m responsible for a deanery, diocese or other large grouping of parishes. I’m a lone Catholic with no-one else who shares my vision. Don’t panic! You can do a great deal on your own, because effective evangelisation generally takes place within existing relationships. There are some things you can do to hone your skills at sharing your faith in a way that doesn’t put other people off. Learn to be sensitive to where other people are in their growth towards faith. Read Sherry Weddell’s Forming Intentional Disciples and watch the Proclaim’15 video on Sharing the Gospel Message. Practice giving your testimony – and watch the video on Testimonies. You can volunteer to your parish priest to “mentor” anyone who needs a confirmation sponsor or has expressed interest in the Church. You could get involved as a volunteer with one of the non-parochial Catholic groups which runs faith-deepening activities – groups such as Youth 2000 or Celebrate. You could also get involved with other local Christians running Alpha. There are lots of other ‘lifestyle’ suggestions from the Home Mission Desk. There are a few of us in my parish who want to evangelize, but my parish priest isn’t interested. This isn’t unusual. Hard-pressed parish priests might worry that they don’t have time to manage another parish group, or might be struggling to sustain the parish RCIA arrangements and worry about how they would manage if you were successful in your evangelising. Nevertheless, a parish priest has no authority to stop any group of Catholics from meeting and praying on their own private property (see paragraphs 19 and 25 of Apostolicam Actuositatem). See the advice above for a lone Catholic, but discuss and do these things together. As a mutual support group, watch the Proclaim’15 resources or Pass It On. I’ve been asked by my parish priest to start an evangelisation group. Great! So first you need to form your group and do some general training. Then you need to identify what particular opportunities there are in your parish and get some training and do some planning around your project. If your team doesn’t feel very confident, you could run some more extensive training – in 5 sessions you can do Pass It On, or in 18 short or 9 long sessions you can use the Relit Evangelisation Course (that’s not cheap to buy, though). After basic training, it’s time to decide what kind of project your group will tackle. Here, the Southwark Handbook can be invaluable. You will probably settle on one of three kinds of projects – to reach non-churchgoing Catholics, to reach people with no particular faith background, or to help those who already worship in your parish to move from being mere churchgoers to missionary disciples. Of all the human beings who don’t attend Mass, non-Churchgoing Catholics are the easiest target. They are members of the families of the people who do go to Mass. They are parents at the local Catholic School. They are easy to identify – but hard to shift. Dr Ann Casson’s 2014 research established that young Catholic parents consider themselves “good Catholics” if they are kind to other people and turn up in church at Christmas and Easter. The Catholic Church’s focus on non-Churchgoing Catholics in England and Wales is branded as Crossing the Threshold and an e-manual is available, as well as a video from Proclaim’15. There are also extensive resources for use around Christmas and Easter. You may wish to adopt one of the established packages – Keeping In Touch, Landings or Catholics Returning Home. The most challenging project for most Catholics will be the prospect of sharing the Catholic faith with people who have no prior Catholic connections. Pioneering work in this regard has been done by the Seeker Centre at Pantasaph, who have developed an Evangelisation Manual. There is also a Proclaim’15 video. You could run an Alpha, which contains only basic teaching common to all mainstream Christian traditions. If you have a town centre location, you might consider the Nightfever model, or offer some other kind of Prayer Experience. Other tools for deepening the faith of a congregation include Bishop Robert Barron’s Catholicism resources and the video sets from Café, but remember that education alone may not be enough – parishioners need to be confronted with the challenge of taking God seriously. Some courses (e.g. The Gift) do include a step of personal commitment but a parish mission can help more people take that step, and help to run a parish mission is available from groups like Café and the Sion Community. I’m a parish priest, but I’m not sure what to do. Your calling is to be an enabler of evangelisation. Found a team, and let them take the steps above. Your job is to equip the laity – they will connect with people you would never meet in your daily activities. But also have a strategy for your parish with evangelisation as an integral part. If your resources allow it, have some kind of pre-RCIA activity, such as Alpha, running all year round, and some kind of parish “Connect and Explore” fellowship which can help regular parishioners deepen their faith, and also serve as a post-RCIA opportunity. If your parish is too small to do that, you may need to consciously focus on raising the commitment level of existing worshippers, following the pattern of Divine Renovation. In your preaching, be conscious of the need to draw your congregation on a journey from membership to discipleship. You don’t have time to read a book, so try this short summary of Forming Intentional Disciples. When you feel the time is right to issue a more direct challenge, run a Parish Mission. I’ve been made responsible for promoting evangelisation across a diocese, deanery or cluster. Great! The most important thing is to resist the temptation to put on some “big event” aimed at unchurched people or non-churchgoing Catholics. Big events only ever work when you have an enthusiastic network of churchgoers ready and willing to invite their non-churchgoing friends to come with them. There is value in having networking events for active evangelisers to support each other. The wider the area, the lower the frequency. A city might have a monthly gathering for evangelisers – a diocese might have a convention once every year or two. You can organise regional events to pray for intercession – you can use the Proclaim’15 Prayer Resources, the Mass for the New Evangelisation, or the Masses on pages 810-823 and 1342-1345 of the British & Australian Roman Missal. Above all, promote evangelisation at the grassroots level – most effective evangelisation is carried out by individuals and fostered by parishes. Promote all the small-scale solutions above and encourage your evangelisers to persevere. May the Lord who has begun the good work in you, bring it to completion!